Tallulah McIntosh has been riding for over 20 years. From riding and training young horses from scratch to teaching all ages and abilities, Tallulah's calm and sensitive manner is a winner. 14 years of teaching and continuing to gain her ABRS qualifications Tallulah is always keen to improve her skills and knowledge, to that end she is a part time working student with Heather Moffet, founder of Enlightened Equitation. During her time with Heather she has gained her Level 3 EE instructor certificate. 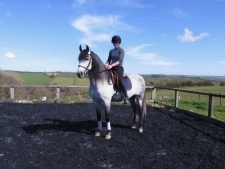 Tallulah is available for Enlightened Equitation lessons every Wednesday from 10am - 4pm. If you would like more information or to book please call 01752 837000.